WINCHESTER — John Reuter’s services to photography, which are considerable, extend beyond his own photography, which is notable. Both involve that most distinctive of photographic processes, the Polaroid. For many years, Reuter was director of Polaroid’s 20x24 Studio, which let photographers put to use the corporation’s celebrated large-format camera. In his own work, he’s used various Polaroid processes for more than four decades. Some 70 examples of that work can be found in “Shadows and Traces.” Curated by Barbara P. Hitchcock, the show runs at the Griffin Museum of Photography through March 3. Photography for Reuter is a lush, lavish, in-dwelling enterprise. The medium in his hands turns its back on the external world to go more fully and deeply into the imagination. The initial photographic image becomes a (figurative) canvas, to which Reuter variously applies paints, dyes, pastels, collaging. In a nice touch, the show includes a display of Reuter’s pigments, brushes, and other tools. This isn’t so much art for art’s sake as art for everything’s sake. Life within the frame is not to be mistaken for life outside it. There’s a sense of totality to each photograph. That’s true whether they’re as small as just over 3 inches square, more or less (the classic SX-70 format), 3 inches by 5 inches, 8 inches by 10 inches, or, yes, 20 inches by 24 inches. Scale matters less as a determining factor within such a realm of hothouse intensity. All art is about other art. Reuter’s is really about other art: beauty as belief system. The images convey a sense of impacted religiosity. They’re aestheticism as exaltation. The effect can be slightly overripe, sometimes more than slightly. One gets the strong impression that if touched the pictures would bruise. 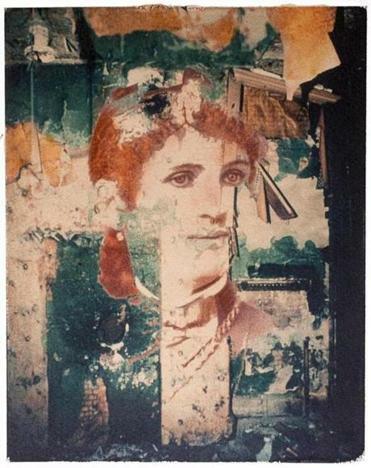 Many of the titles partake of a verbal sensuousness to match what one sees: “The Androgyne Attempts to Prevent the Annunication,” the series “Spirits of Père La Chaise,” a somewhat creatively spelled homage to the Parisian cemetery. For Reuter, identity is incidental, at best. A who may be part of the visual package, but it’s never the package itself. Identity — how the self is presented, or, if you prefer, packaged — is central to the other shows now at the Griffin. They, too, run through March 3. The 25 images in Linda Troeller’s “Self Reflection” are impressively varied. Several, in fact, were taken by other photographers: Joel Sternfeld, Lucien Clergue, Andrew Serrano, A.D. Coleman. Troeller was for many years a photographer’s model, so the move to the other side of the camera came naturally to her. The images range in date from 1973 to 2013. Her display of extended self-scrutiny is arresting. Troeller offers a consistent interplay between concealment and presentation. She knows that what people choose not to show can be as revealing as what they do. The witty “Hiding, The Hotel Roosevelt” conceals twice over. We see only a bit of Troeller, and that bit is reflected in a mirror. Seeing is never the same thing as knowing, something she knows perfectly well. With J.K. Lavin’s “Crisis of Experience” self-scrutiny trades variety for continuity. It consists of 16 tightly framed Polaroid self-portraits, in color, all but one taken between 1979 and 1982. Lavin stares at the camera — her camera, don’t forget — sometimes in shadow, sometimes a bit out of focus, sometimes her face a bit cropped. The only real clue to changes in time is changes in hairstyle. Throughout she’s trying to get at a mystery behind a mystery: The self each of us presents to the world, complex as it is, is so much simpler than the self presented to itself. Or is it?